Pinterest it seems is growing each and every day with new members. Pinterest is an online free community bulletin board where you get your own page and can pin photos virtually to your bulletin boards. If you can think of a theme a color a subject then you can create a bulletin board to match and pin pictures you find online and pics of your own you upload. What’s cool about Pinterest is that your virtual boards start to get noticed by the Pinterest online community and they start to follow you and re-pin your pics onto their boards as well as “like” your pics by clicking the ‘like’ button and before you know it, you have a bunch of followers who like your boards and pictures and you too can like and re-pin their pics too onto your boards. 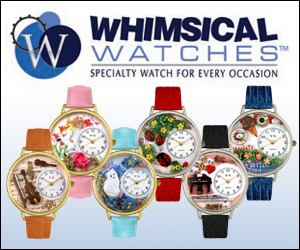 I think all of us Bichon Frise lovers should create a “Bichon Frise” board!! I created my Bichon Frise board and am having such fun pinning pics of our Bichon Luna as well as the cute Bichons I find online. 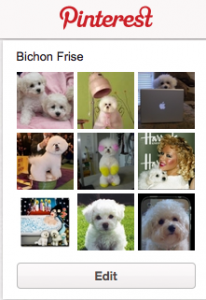 I would love to see your Bichon Frise pics on Pinterest! !